The following is an overview of human rights violations in Iran on February 2nd, 2019 based on the information compiled and verified by Human Rights Activists News Agency (HRANA). (1) Karim Mohebbi was executed in the central prison of Tabriz on the charge of murder and another prisoner was sentenced to public hanging in Gilan. (2) More than four protests were organized across the country. Educators in the cities of Karun and Bavi, the customers of two Iranian automakers, Iran Khodro (IKCO) and Kerman Motor, the students of Islamic Azad University, Science and Research Branch in Tehran, and the investors of the project of Shahid Keshvari in Isfahan have held separate protests to request their demands. (3) A landmine explosion severely injured a citizen in the city of Dehloran. More than 42 thousand square kilometers of the lands in the Iran‘s western provinces contain landmines left from the Iran-Iraq war. Dehloran is in the Ilam province. (4) Five Baha’i residents of Shiraz have been sentenced to six months imprisonment, each, on the charge of “propaganda against the state”. They were identified as the following: Farhad Sarafraz, Shahram Mansour, Vahid Dana, Saeed Abedi, and Adib Haqpajouh. (5) An Azerbaijani Turkic minority rights activist, Hakimeh Ahmadi, is in prison since October 18, 2018. According to Hrana, she underwent hospital treatment for rib cage and finger injuries which have been occurred in the Intelligence detention in Marand County. Security forces entered Ahmadi’s home on October 18th, threatening both her and her spouse with a weapon. She was arrested and transferred without explanation to an undisclosed location. In a video which was published on October 30th, Ahmadi’s husband, Gholamreza Ghorbani, related news of her hospital transfer, explaining that authorities had refused to disclose where she had been admitted, forbade him from visiting, and advised him that pending treatments would be at his and Ahmadi’s expense. (6) Expulsion of Sepehr Shahidi Ghamsari, a Baha’i civil engineering student from Sina Higher Education Institute in Kashan due to his faith. Baha’i students in Iran routinely experience either denial of entrance to university or removal from student lists during their studies. Numerous reports are published annually regarding the barring of Baha’i citizens from education. (7) Reza Khandan and Farhad Meysami filed an appeal against their conviction. They have been sentenced to six years in prison each, and were banned for two years form traveling, membership in any social or political group, and internet activism. 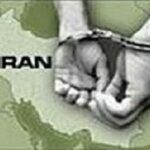 (8) The second court session of eight environmentalists on the espionage-related charges was in session in Tehran. Moreover, five of the detained environmental activists were charged with “corruption on earth”. (9) A detained Baha’i citizen, Maryam Ghafarmanesh , was arrested on September 16th, 2019. Her family did not receive any answer to why, and for how long, she will be held in prison. She was one of the eight Baha’i citizen who were arrested and transferred to Evin prison between September 16th and October 17th. They were identified as Parvan Manavi, Elham Salmanzadeh, Hooman Khoshnam, Payam Shabani, Peyman Manavi, Maryam Ghaffarmanesh, Jamileh Pakrou (Mohammad Hossein) and Kianoush Salmanzadeh. (10) Jafar Azimzadeh, the leading member of the Free Union of Workers in Iran, was transferred to Evin prison to serve his six-year prison term. Moreover, Azimzadeh and Shapour Ehsanirad have been acquitted of charges of “acting against national security” in June 2018. In 2016 he was sentenced to 17 years in prison over charges of “propaganda against the state” and “assembly and collusion against national security through organizing an illegal group’. (11) Hossein Rezaei, a teacher and the secretary of the teachers’ union in Bushehr, who was arrested on January 26, was released on bail. He had been summoned twice to the intelligence office and was interrogated in January. (12) The workers of Saman Tile Manufacturing Company in Borujerd, have more than four years of unpaid wages. The workers of IranPetroTech have also unpaid wages and 12 workers of this company have been laid off last month. (13) A labor activist, Behnam Ebrahimzadeh, has been detained for one month and a half, although his family provided his bail bond which has been set for 200 million Toman [approximately 20 thousand USD]. He had been released from prison last year after finishing his seven years sentence. (14) The special needs students’ transportation vehicle crashed, leaving eight injured in Sharafkhaneh in Shabestar County in the East Azerbaijan Province. (15) Iran has six thousand disabled veteran women of Iran-Iraq War and more than six thousand women had been killed in this war. These women and their families have been treated unequally by the government and the society in comparison with men veterans. (16) Saeed Malekpour’s mother wrote an open letter to Tehran’s Prosecutor General to request her son’s release after serving ten years in prison. A Canadian resident and alumna of Sharif University was arrested in 2008, during a trip to Iran on blasphemy-related charges. According to Hrana, the Cyber Unit of the Islamic Revolutionary Guard Corps (IRGC), accusing Malekpour of managing Persian-language pornographic websites, arrested him during a trip to Iran to visit his family and sentenced him to death plus seven and a half years in prison, on counts of “propaganda against the regime,” “blasphemy,” “insulting the Supreme Leader,” “insulting the president,” “contacting opposition groups” and “corruption on earth.” Malekpour’s death penalty sentence was eventually reduced to a life sentence. Throughout his legal proceedings, Malekpour has insisted that case analysis by a computer and internet expert would absolve him of the charges. (17) Hamid Askari, a singer, was banned from working and the rest of his concerts have been canceled because of featuring a female vocalist and guitar player, Negin Parsa, in his concert. Women are prohibited from singing or playing musical instruments solo in Iran. Human Rights Activists News Agency (HRANA) – In the absence of both the defendants and their attorneys, Branch 1 of the Revolutionary Court of Shiraz has sentenced five of its Baha’i citizens –Farhad Sarafraz, Shahram Mansour, Vahid Dana, Saeid Abedi, and Adib Haghpajouh– to one year in prison and one year in exile each. ”All five men were accused of ‘Propaganda against the regime,'” an informed source told HRANA. The verdict stipulates that all five will serve their sentences in different cities of the Fars province: Sarafaraz is to be exiled to Jahrom, Mansour to Eghlid, Dana to Arsanjan, and Haghpajouh to Larestan. On August 5, 2014, HRANA reported the arrest of Haghpajouh, Abedi, and Dana; Mansour and Sarafraz were detained by Shiraz security forces four days prior. Iranian Baha’i citizens are systematically deprived of religious freedoms, while according to Article 18 of the Universal Declaration of Human Rights and Article 18 of the International Covenant on Civil and Political Rights, everyone is entitled to freedom of religion and belief, and the right to adopt and manifest the religion of their choice, be it individually, in groups, in public, or in private. Based on unofficial sources, more than 300,000 Baha’is live in Iran. However, Iran’s Constitution only recognizes Islam, Christianity, Judaism, and Zoroastrianism, and does not acknowledge the Baha’i faith as an official religion. Consequently, the rights of Baha’is are systematically violated in Iran. HRANA News Agency – On the morning of September 1, security forces arrested Mr. Shahram Mansour at his home, and transferred him to the Ministry of Intelligence’s Facility 100 in Shiraz.